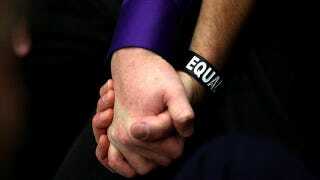 For the first time ever, a poll shows a majority of Americans think gay marriage should be legal. And support is up even among some of the most traditionally opposed groups. According to Talking Points Memo, the ABC/Washington Post poll found that 53% of respondents supported gay marriage, while 44% were against it. That's up from 47% in favor in 2006, and just 32% in 2004. And as the survey press release makes clear, even groups that have long opposed gay marriage are starting to shift. Among white Catholics, support is up 23% since 2006. Among people over 65, it's up 15%. And among white evangelical Christians, it's up 11%. Clearly, there are still those who believe gay people need "repairing," not equality. And 53% isn't good enough, especially when gay marriage is still illegal in most states. But the first-ever majority is a big deal — as is the revelation that homophobia is losing its grip on some of its former strongholds. We hope the trend continues.